Copyright 2009 by Joel York at Chaotic Flow. Save it or share it with a colleague. 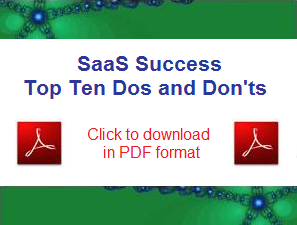 Click the image above to download the SaaS Top Ten PDF. Software-as-a-service providers are by definition Web publishers. Traditional Web publishers, whether their business is news, games, e-commerce, or a simple blog, are obsessed with increasing site traffic and converting it to registered users. On the Web, there is one and only one source of site traffic: links. Links from search results, links from search ads, links from banner ads, links from websites, links from blogs, links from feeds, links from widgets, links from bookmarks, links from toolbars�links, links, links. If you want to drive traffic to your site, then you must become a nexus of incoming, high quality links from sources that are relevant to your business, and most importantly relevant to your prospects� needs. There is nothing else as cheap or as effective at generating online demand. Clicking on a link is often the first step in the online purchase process. Understanding and improving your Web presence is as important as improving your sales pipeline close ratios (more important if you are a startup), because you have to get the leads in order to close them. What is your link strategy? Links come in two categories: paid/transient and free/permanent. The more free links you have, the fewer paid links you need. Most SaaS vendors instinctively turn to paid search (SEM) to generate site traffic. They also apply search engine optimization (SEO) techniques to refine the keywords on their websites, but only obscure keywords are useful without high PageRank, and high PageRank requires (that�s right, you guessed it) links. Link opportunities abound and arise naturally from your online business, but you have to be conscious of their critical importance to capitalize on them. What Web properties, be they commerce or community, form the basis of your potential online network? Make a list. On the commerce side, it might include search engines, trade publications, events, associations, directories, and even your own product. On the community side, the list might include customers, partners, investors, employees, colleagues, blogs, widgets, social networks and media sharing sites. Once you have the list, make a plan. Reach out in a manner that generates content and conversation that will be of interest to your prospects, and provides that essential call to action�a link.